For a fun and colorful campfire or fireplace display, you can soak pine cones, wood chips or newspaper-rolls in chemical solutions prior to burning. Whether for personal use or as a club/group project, we indicate what to do and what to use to create these flame displays. Start by soaking dry pine cones, wood chips, or even rolled up newspapers in specially prepared chemical solutions. See the list below for chemicals that produce colored effects when burned. These chemical products shows the flame colors produced in PROJECT ONE. Please click through for current pricing. To treat your dried material, mix about one pound (454g) of chemical per gallon of water in a plastic container. An empty five-gallon pail is ideal. Avoid metal containers because some chemicals may react and damage the container. Wear rubber gloves and safety glasses when handling chemicals. Work outside or in an appropriate work area. Some chemicals may stain your work surface. Work with one batch of chemicals at a time to achieve the brightest colors. Dull colors could result if fuel is soaked in different solutions. A day of soaking should give the chemicals time to soak into the wood. Afterwards, lift and drain over the pail and spread on newspaper to dry. The newspaper can also be burned by rolling and wrapping tightly to form "logs". Another variation for creating fireplace colors is to make wax cakes containing chemicals. Start by melting paraffin (from candle stubs or from blocks of canning wax from the grocery store) in a double boiler. Do not melt over an open flame or it may ignite. Stir in one or two tablespoons of the recommended dry chemical. Let it cool, but while it is still liquid, pour the wax into small paper cake cups. When these have set they can be placed into a fireplace just like the treated pine cones described above. For longer burning pine cones or to make colorful fire starters, melt paraffin wax as above. Dip pine cones in the wax then sprinkle with one of the listed chemicals before the wax completely sets. Or, try coating dry pine cones in white glue and sprinkling them with chemicals to produce a firestarter that burns brightly with color. Avoid permanganates, nitrates and chlorates. These produce harmful byproducts when burned. Project 2: Flame Color Tests Using Metal Salts. 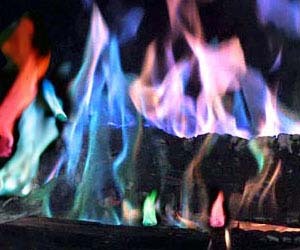 You can create a variety of colored flames by burning a small amount of different metal salts in a fire. In the lab, use a Bunsen burner or propane torch. Some metals will burn with a characteristic flame color. To perform a flame test a powdered sample of chemical (see list below) is placed onto a platinum or Nichrome wire loop and suspended in a Bunsen burner (or propane torch) flame. It is important to first clean the wire loop in the flame so no contaminating dust interferes with the true color of the test sample flame. When a metal or metal salt is burned, the input of thermal energy raises the electrons in the metal atom to a higher energy state. These electrons cannot remain in this excited state for too long and will emit energy in the form of light to return to the more stable, grounded state. It is this light we see when a metal atom is burned in a flame. Each metal has a characteristic flame color which has been found to be useful in identifying minerals. These chemical products shows the flame colors produced in PROJECT TWO. White sparks Magnesium ribbon, 12"
Yellow sparks Iron filings, 1lb. You get 10 grams each of... Strontium Chloride, Sodium Carbonate, Cupric Sulfate, Potassium Chloride, Cupric Chloride. Plus... 12 inches of Magnesium Ribbon, an Alcohol Lamp, and Nichrome Wire. You get 100 grams each of... Strontium Chloride, Sodium Carbonate, Cupric Sulfate, Potassium Chloride, Cupric Chloride. Plus a 12.5 gram roll of Magnesium Ribbon.